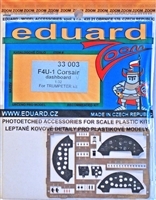 Eduard is well known for their detailed metal photo-etch sets which are produced as pre-painted color, self adhesive or original bare metal, that you can custom paint. Item #72004. 1/48 scale. Photo etched metal parts. Item #48043. 1/48 scale. Photo etched detail set for Dragon kit. Item #48061. 1/48 scale. Photo etched detail set for Hasegawa kit. Item #72001. 1/48 scale. Photo etched metal parts. Item #48056. 1/48 scale. Photo etched detail set for plastic aircraft kit. Item #48014. 1/48 scale. Photo etched metal parts for plastic model. Item #72085. 1/72 scale. Photo etched. Eduard Item #FE372. 1/48 scale. 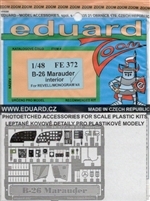 Photo etch detail set from the Zoom line, produced by Eduard for a scale model B-26 Marauder interior. Recommended for Revell/Monogram kit. Set is pre-painted in color. Eduard Zoom #33007 1/32 P-51D Mustang Eduard #48107 1/48 Spitfire Mk.V fl. Item #33007. 1/32 scale. Dashboard photo etch set for Hasegawa 35248 kit. Item #48107. 1/48 scale. Photo etched detail set for Hasegawa kit. Item #33003. 1/32 scale. Detailing set of dashboard for Trumpeter F4U-1 Corsair kit. Eduard Zoom line of photo-etch. Item #48039. 1/48 scale. Photo etched detail set for Academy kit. Item #48283. 1/48 scale. Detail set for Revell kit. Item #72182. 1/72 scale. Photo etched for Dragon kit. Item #48065. 1/48 scale. 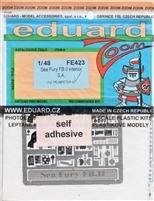 Photo etched detail set for aircraft plastic kit. Item #73007. 1/72 scale. Color photo etch set of U.S. 12.7mm/.50 caliber ammunition belts.